Government of Karnataka, Kalaburgi (Gulbarga) District Revenue Department invites applications for recruitment of Village Accountants (VA Jobs) for filing up 32 Vacancies. Eligible candidates may apply for the VA Posts available in the Kalaburgi Revenue Department. 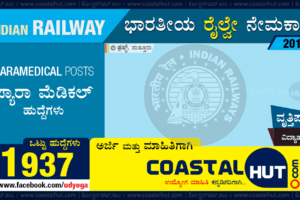 All these posts are reserved for Hyderabad-Karnataka Region Candidates only. I’m from basava Kalyan. I got puc 85.33 .shall I got this job please reply sir. It’s my humbal request. I am from Kundapura.i got puc 74.3.shall I got this job please inform me. Hi sir GM. I’m from basava Kalyan. What is the minimum percentage need to got this job. My puc 85.3a cast. Shall I got this job please reply sir. Minimum Marks Required is PASS Class (i.e., 35%), But, the selections will be done only on the basis of merit (toppers) marks in PUC. Hi sir/ medam im in Banglore my humble ricvesting. I comlited final year digree BA. Im waiting for job so You pls give me the Infarmation abhout this job sir thank you..
How many Post are there in 3 a cast. What is cut off marks.plz reaply sir. Please refer the official notification. PDF document provided above. Mr. Saqib, please note that only PUC (from Karnataka) or CBSC or ICSE are allowed to apply to these posts. All other boards including Kaseeb are not allowed. Further, PUC in Karnataka State is awarded by Department of Pre University Education, Bangalore (PUE Board). Thanks for your kind Response sir..
Then am I eligible or Not to apply for this vacancies sir? If your mark card is issued from Department of Pre University Education, Govt. of Karnataka, you are ELIGIBLE to apply. You can tick PUC option in the Application. Thank you so much to coastalhunt team For your responses to all of us. .. Yes. You can pay through online mode as well. After successful payment, you will get E-Receipt from SBI. Print it and produce during the verification. 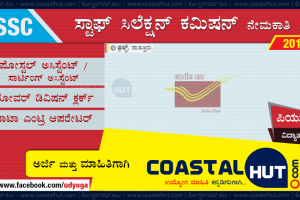 Application Copy, Challan Copy, SSLC Mark Card, PUC Mark Card, Reservation Certificates (Such as Caste Certificate, Kannada Medium, Rural, Hyderabad-Karnataka, etc.) to be carried in Original format. When there will be announcement of merit list for gulbarga ve post?? ?